The Minicom by Tripplite 0DT60002 is a PS/2 to USB Converter which is a small, plug & play converter that transforms PS/2 equipment from outdated devices to valuable tools for today's data centers. Rather than advocate "rip and replace" IT solutions, Minicom by Tripplite's Real Needs approach preserves past investments by repurposing and updating existing IT equipment. 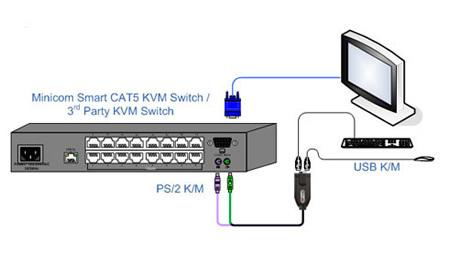 Once you have gone through the hassle of setting up a KVM switch, for example, it is inconvenient and expensive to throw it out and start from scratch. With the PS/2 to USB Converter, your life at the rack only gets easier: you can now use your KVM switch with a new generation USB keyboard and mouse. Whether your PS/2 KVM switches are from Minicom by Tripplite or not, you can still extend the life of the IT equipment that you already bought. Dimensions 3.54 x 1.18 in.